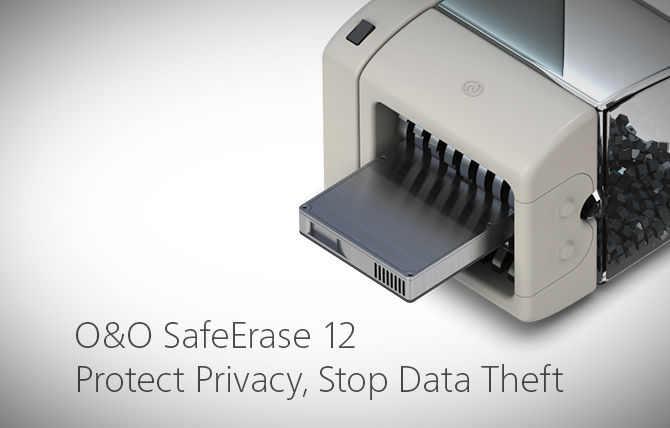 O&O SafeErase affords you the maximum protection for your confidential data, your internet history and your identity. Your personal photos and confidential documents can easily fall into the wrong hands when you sell, give away or dispose of your old PC or hard drives. That is exactly what many people do when upgrading to the latest Windows operating system and/or buying new hardware. Identity theft is now a widespread security threat. This is because clicking on “Delete” does not mean your files are permanently deleted. Even formatting the hard disk is not enough to permanently delete data! Do not risk your confidential data! O&O SafeErase permanently deletes your confidential files using recognized methods so that a recovery is never possible, not even when using the best file recovery software. It also deletes all your internet history so that nobody will be able to detect your internet traces and your online accounts are protected from data thieves or hackers. All files, settings, applications and the operating system are deleted so that a recovery even with the best file recovery software is impossible. You can delete an entire computer including the system partition without boot media. After restarting the system, the deletion process begins automatically. Should an SSD not support TRIM, then the data is overwritten with zeros to avoid wear effects. When surfing the Internet, your browser usually stores Internet files unnoticed on your hard drive. These files can provide information about websites you’ve visited or the passwords you’ve entered. It makes no difference whether it involves cookies, data entered on forms, or browsing history – O&O SafeErase lists all the information saved for each browser you use, and you can then delete them individually or together. Once deleted, nobody will be able to detect your Internet traces and your online accounts are protected from data thieves or hackers. Version 12 supports Microsoft Edge, Internet Explorer, Google Chrome and Firefox. Deleting the entire computer allows you to permanently delete all confidential files before you dispose of, sell, or give your computer away. All files, settings, applications and the operating system itself are deleted so that a file recovery is impossible. You can be sure that nobody will ever restore your confidential information and misuse it, protecting yourself against identity theft. With O&O SafeErase you can even delete your entire computer without a start medium (e.g. a Boot CD).